Do you have what it takes to conquer the property market and become a property tycoon? Do you want to practise and improve your English oral communication skills in a fun way? 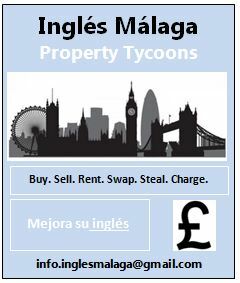 To become the top Inglés Málaga property tycoon, you have to collect more properties than your opponents, and you will need a lot more than luck and money to win. You will be given some cash to get you started on the property ladder, but you will have to use you English language communication skills in order to raise more money to continue buying the must-have properties and must-see attractions of London. For instance, you will be able to charge rent, fine tenants for some bogus reason, and perhaps demand money for your birthday. In addition, if you play your cards right, you might have the opportunity to steal your opponents´ properties, or send them to jail for illegal deals. If you think you’ve got what it takes to be an Inglés Málaga Property Tycoon, and you want to improve your English communication skills in an entertaining way, why not take part in the Inglés Málaga Property Tycoon event?